Rather than being gentle giants, new research reveals that Pleistocene cave bears, a species which became extinct 20,000 years ago, ate both plants and animals and competed for food with the other contemporary large carnivores of the time such as hyaenas, lions, wolves, and our own human ancestors. The research is published this week in the Proceedings of the National Academy of Sciences (PNAS). Joao Zilhao, Professor in Palaeolithic Archaeology at the University of Bristol, Professor Erik Trinkaus of Washington University and colleagues in Europe made the discovery while dating the remains from Europe's earliest modern humans. 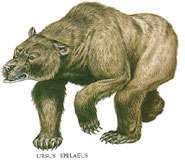 Cave bears (Ursus spelaeus) have long fascinated paleontologists and anthropologists, given the abundance of their large skeletal remains in Pleistocene hibernation caves across western Eurasia. For the past 30 years, studies of their bones and teeth, and especially the nitrogen isotopes in their bone protein, have concluded that they were largely vegetarian. The interpretation of them as vegetarian has evoked an image of gentle giants, feeding on berries and roots. However, new nitrogen isotope data from the Pestera cu Oase in southwestern Romania shows otherwise. Although many of these cave bears appear to have been largely vegetarian, the Oase bears and scattered individuals from other cave sites show that they were sometimes as omnivorous as modern brown bears, including North American Kodiak and grizzly bears. Professor Zilhao said: "Our work at Oase mainly concerned the recovery and dating of the remains from Europe's earliest modern humans, which we found at this cave site, but the cave is no less important as one of the best, if not the best cave bear hibernation site in Europe.